He was already bercucu, but do not call the old Ernestine Shepherd. Female 74 years old from Baltimore, United States, have recently been crowned as the world's oldest female bodybuilders of all time by the Guinness Book of World Records. Appearance of this mighty grandmother was remarkable. Her body was the envy of many people. Why not, his body slender with muscular legs and arms. The most amazing thing is his stomach, six-pack. To the Washington Post, he said, "Age is just numbers." In that age, my grandmother Shepherd is still a fitness instructor. Granny one grandson that also gives an example. "If you want to motivate others, you have to do the same thing," he said. In addition to teaching fitness, mother of one boy was diligent practice. Unmitigated, his coach is Yohnnie Shambourger (57), a former Mr. Universe who won the gold medal for bodybuilding at the Pan American Games 1995. 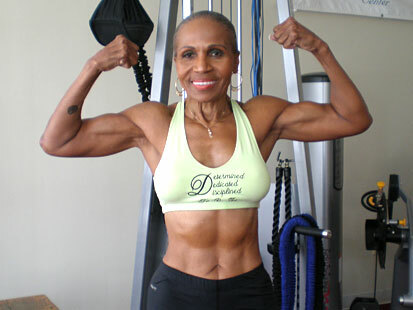 Over the last 18 years, Ernestine Shepherd is following the marathon race nine and won two bodybuilding competitions. "You are a champion, and I will train you like a champion," he said Shambourger motivate their students. Shepherd wake up every day at 03.00 in the morning to meditate. Then he ran as far as 16 kilometers exercising in a city park. Of course he keep eating. She only ate brown rice, chicken breast and vegetables, then menggelontornya with a glass of raw egg white. That's the menu three times a day and every day. Shepherd also admitted to not like sweet foods. Shepherd admitted he had a lazy person. He does not like to do physical activity. Until one day, he and Mildred, his sister, realizes that their bodies start softening. No matter her age was 56 years old, brother and sister who are very familiar began training at a fitness center. Because satisfied with the results, they also increase the intensity of exercise. They even started to dare to follow the bodybuilding competition. Over the last 18 years, Grandma Shepherd've been following a marathon race nine and won two bodybuilding competitions. Ernestine Shepherd lives with her husband, Colin, who has been married for 54 years. He also lived with his son and grandson. Seeing him train so hard, many people said he would quickly die. "We're all going to die. However, I am more concerned with quality of life I live," he said.